The Applaws Layers is tasty, layered wet food. The bottom layer consists of tender and lean chicken meat. The top layer is a combination of lamb and creamy jelly. 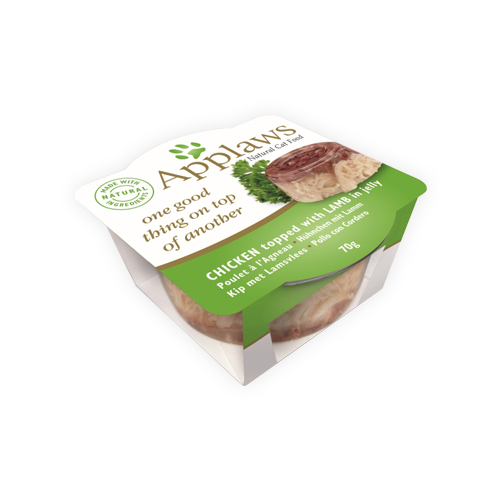 Applaws Chicken Layers are available in a pack of 12 70-gram pots. The Applaws Layers combine two natural ingredients in a tasty wet food. This protein-rich food consists of two layers: one layer with lean and tender chicken meat and a toping of lamb. This is enveloped in a jelly made from seaweed. Applaws Chicken Layers is grain-free. This has a positive influence on your cat’s digestive system. This food is a natural source of taurine. This nutrient supports the condition of the eyes and is beneficial for the heart. Chicken (40%), lamb (17%), vegetable gelling agent. Have you used Applaws Cat Food - Chicken Layers before? Let us know what you think about this product.